The Boston Celtics received bad news on the cusp of the playoffs. 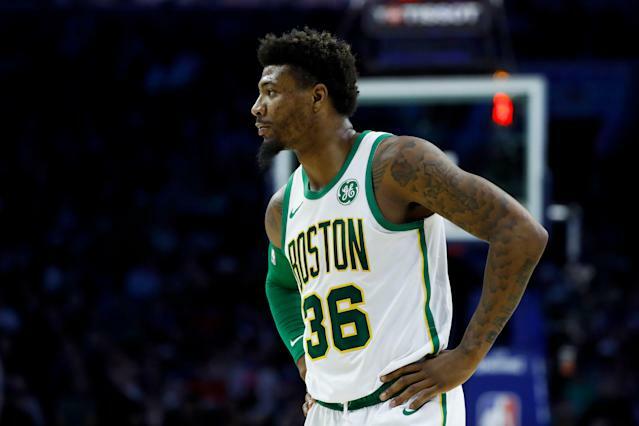 Guard Marcus Smart has suffered a torn left oblique and could miss the first two rounds of the playoffs, ESPN’s Adrian Wojnarowski reports. Smart suffered the injury Sunday in a loss to the Orlando Magic. Originally described by head coach Brad Stevens as an oblique bruise, Smart’s injury appears to be worse that the team initially thought. The Celtics also lost forward Jayson Tatum in the same game to a shin contusion. Tatum’s MRI came back clean, and he hopes to be available for Boston’s first playoff game. Smart is a key part of Boston’s gameplan. He started in 60 games this season, averaging 8.9 points, 4 assists and 2.9 rebounds. He’s also one of the team’s best on-ball defenders. The Celtics are slated to face the Indiana Pacers in the first round of the playoffs as the No. 4 seed with a potential second-round matchup against the Milwaukee Bucks looming if they advance. Missing Smart for either of those series would be a difficult blow. Jaylen Brown and Terry Rozier could see more playing time in his absence.